Give your hard-working champion a special place to showcase ALL those awards with a Personalized Medal and Trophy Holder. We'll personalize with one special name or nickname ... creating a "first-place finish" at no extra charge. 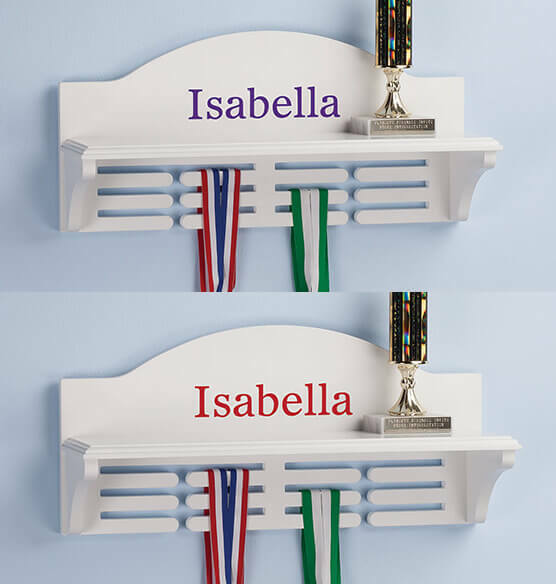 Would this work in a little girls room and be able to hang her headbands and hair pieces of the slots instead of medals? BEST ANSWER: Thank you for your question. It does not have to be metals that are hung on the holder. It can be used for other items such as head bands. We hope this information will be of help to you.